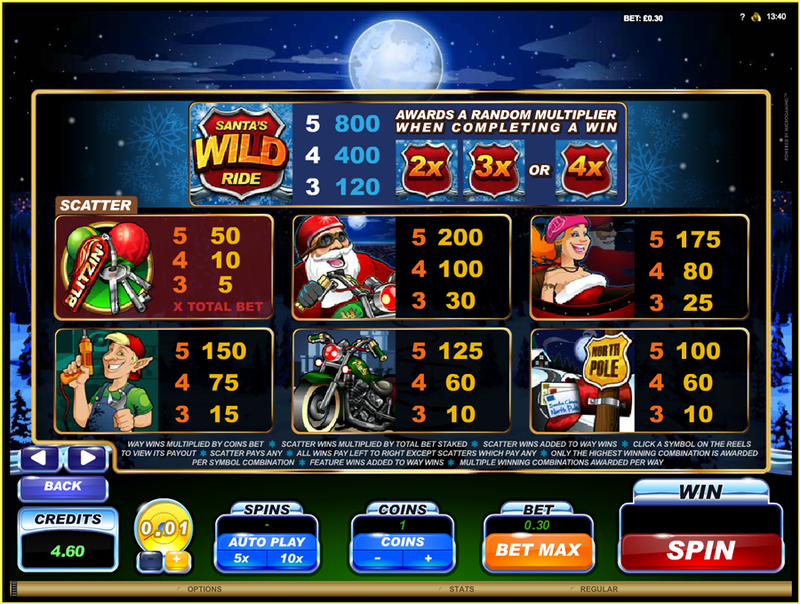 As its nearly Christmas Iv decided to review this old classic from Microgaming, Santa’s Wild Ride. 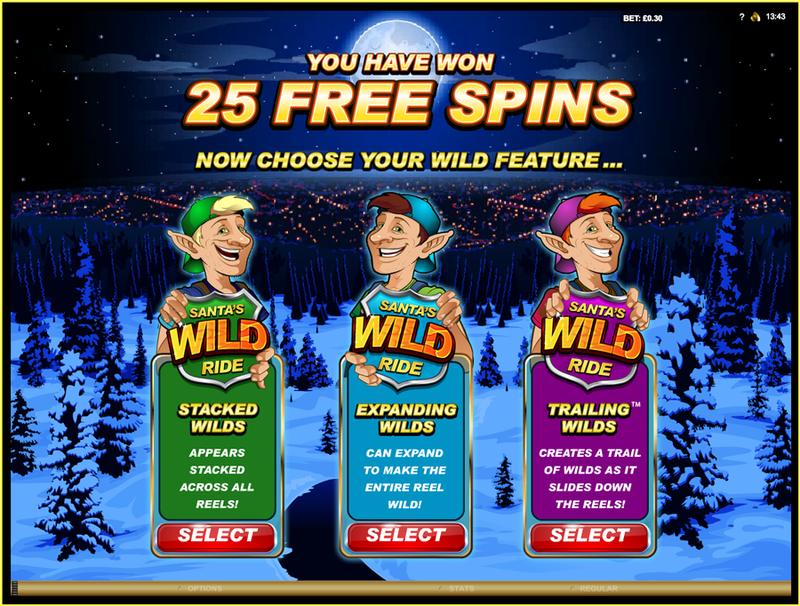 This is one of those games that doesn’t get mentioned a lot and you rarely see it played on streams but it really is a gem of a game, it has 243 ways, every feature is 25 free spins and you can get stacked wilds, trailing wilds and expanding wilds, what more do you want from a game! 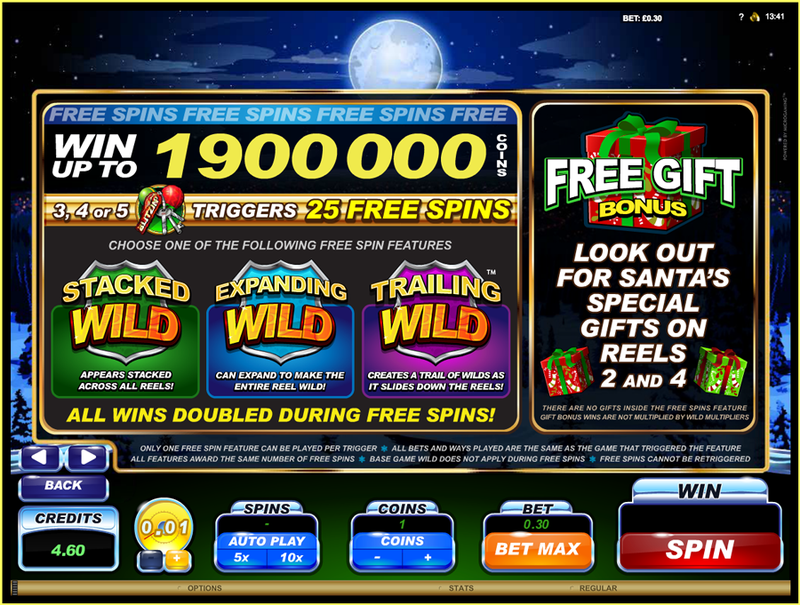 Santa’s Wild Ride has a 5 reel by 3 row setup and rather than lines it’s an all ways pay slot giving 243 ways to win and the opportunity for some good multiple 5 of a kinds, theres one base game feature called Free Gift and its very simple, a present lands on either reel 2 or 4 or even both and opens to reveal a cash prize, now let’s move onto the main free spin feature. 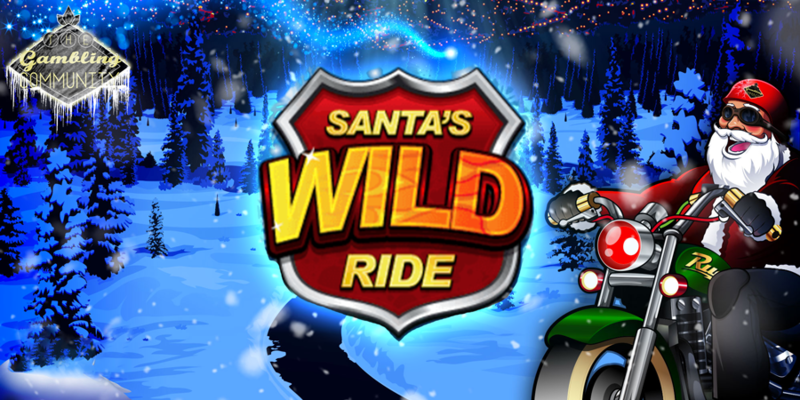 Santa’s Wild Ride has one main feature and this is awarded for landing 3 or more of scatter symbols, you get 25 free spins regardless of how many scatters you get between 3 and 5 but you do get a 50x award for the trigger if you manage to get all 5. 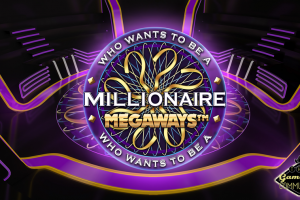 Once you get the feature you’re taken to the screen shown below where you get 3 different choices. The first option is stacked wilds which is fairly self explanatory giving you stacked wilds on all 5 reels, the second choice is expanding wilds where the wilds can expand to cover the whole reel and finally you have the trailing wilds where they stick upon landing and then trail down the reels, basically the same as the trailing wild feature in Avalon 2. The bottom line is all 3 of these features can give you a full screen of wilds and that on its own is worth 6480x your total stake! It’s not quite Immortal Romance but at the same time it’s loads of fun to play and Id go as far as to say it’s more enjoyable, the free spin’s cant be re-triggered. 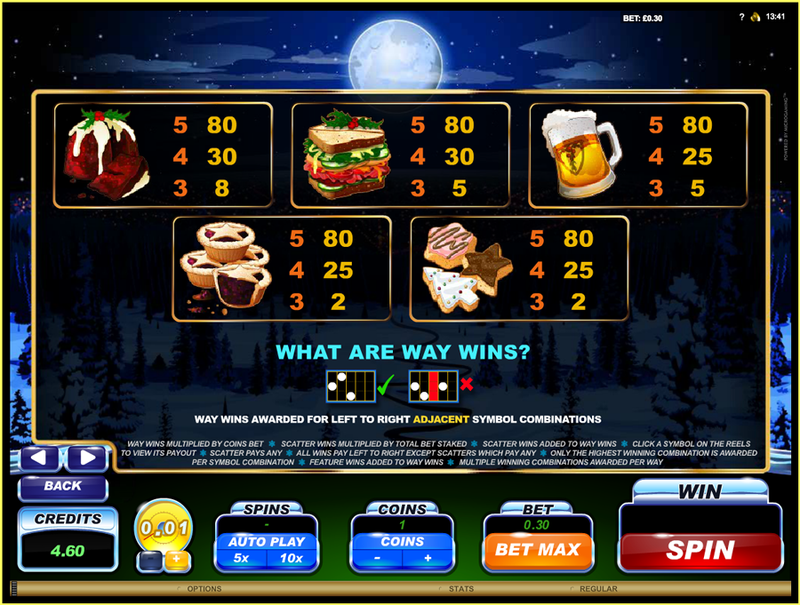 Looking at the paytable in Santa’s Wild Ride we are shown the amount of coins per win and it’s not dynamic so you do need to work out how many coins and what coin value you have which is a pain but then this is an older game so its to be expected. Basically all of the non premium symbols pay 80 coins which in simple terms is 2.66x your stake, if you get any of these wins with a wild you get a mystery multiplier of 2x, 3x or 4x so that makes the wins a bit more respectable especially if you get a few stacked on several reels. Moving onto the premium symbols below we have the North Pole sign paying 3.33x, the motorbike pays 4.16x, santas favourite elf with the power drill pay’s 5x, Mrs Santa with the red hair pays 5.83x, Santa pay’s 6.66x and a wild line pays 26.66x. Now these win’s may not seem huge but when you get a couple of wilds and a few 5 of a kinds in a spin you soon realise 50x win’s are easily achieved and it keeps you ticking over while you play for the main feature where you can win 6480x your stake as I mentioned earlier which even by todays standards is very nice potential. Santa’s Wild Ride has an RTP of 96.47% and Id class it as the higher end of medium variance even though it can pay the same as a real high variance game. 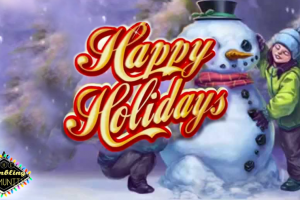 Even though this game is many years old the graphics and sound track are brilliant and it’s great fun to play as well as being very christmassy. If you fancy a go there’s a link below to a TGC trusted casino and as always thanks for reading, you won’t be sorry giving this a spin. 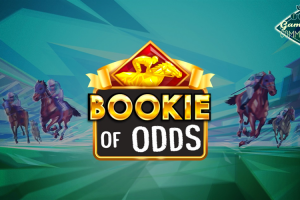 Slotsmillion 100% Non-Sticky Bonus Up To £100 On 1st Deposit Plus 100 Extra Spins.